Having taken a 2 week hiatus from shooting, I find myself a bit rusty with a camera in my hands again. Took me sometime to reacquaint myself with the intricacies of manual metering & focusing. The first couple of shots from my trip to Monterey Bay Aquarium were complete garbage. Fortunately, the shoot wasn’t a complete wash. By the end of the day, I was back on my game, and end up with a few nice shots to show for it. Having a smidgen of experience on shooting aqua-life (see Shark Attack post), I was aware that light was going to be the main problem. So I packed accordingly: a 50mm f/1.4 Nikkor-S, 35mm f/2 Nikkor-O.C, and a 55mm f/3.5 Micro-Nikkor-P.C. All low light performers, plus a macro for the up close and personal. The large aperture lenses are great for these dark conditions, but the trade-off is the razor thin depth-of-field. The next obstacle is choosing a shutter speed that is slow enough for hand-holding, while fast enough to stop the subject motion. When you have low light and moving subjects, even VR/IS isn’t going to help. Finally, I find that ISO 800 is pretty much the highest I want to take it before noise becomes an issue. I have to admit, I find Canon’s high ISO performance to be slightly better than Nikon’s when comparing entry level DSLRs. Of course, the D3 blows everything out of the water, but that’s in another lifetime. The jellyfish exhibit is easily my favorite attraction in the aquarium. It’s a shame that they will be closing the exhibit on Sept 14, 2008. So anyone out there that will be in the Monterey area, do check out this fantastic exhibit before it shuts down. I feel fortunate that I was able to capture a few good shots in there with my DSLR — something I couldn’t do when I had my point-n-shoot. From the crowds I experienced, I can see many others shared the same enthusiasm. I had never heard so many DSLRs firing away all at once. Everybody who had a DSLR was literally holding down the shutter button. Click-Click-Click-Click. I remember all the point-n-shoot folks backing off because us DLSR shooters were so into it. Sony, Canon, Nikon, Pentax — you name it, it was there. It was literally a sea of a cameras at the aquarium. we also had a few DSLR-ers in the aquarium i went too. they seemed to get pissed off if we were in the way. grr. 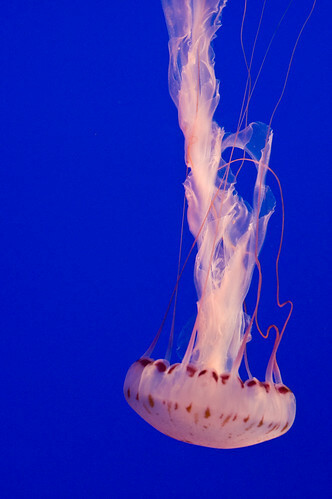 btw, nice shot of the jellyfish! i ended up doing tons of videos instead since videos were much clearer, and showed the essence of the exhibits.